Solaria w/5 acres of green area, low density, gated community w/All Inclusive services. 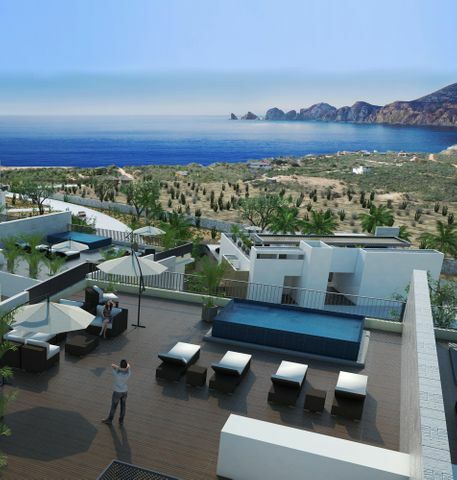 Expansive Sea of Cortez & Pacific Views. Penthouse w/private rooftop decks & pool included. Elevators, Underground & exterior parking for each condo. Offering 1 bedroom 2 baths, 2 bedrooms 2 baths or 3 bedrooms 3 baths. Hot Water on demand, granite & travertine finishes. GE High Profile Appliances- gas ranges & washer/gas dryers, Bodegas. Kids Play Area & Pet-Friendly. 6 Covered, Common area Grill & Dining areas. Offering On site Property Mgmt & Rental program for your convenience. Optional private pools for ground floor condos.